Here’s a back to basics tip and a reminder. Knowing how to read what’s in your browser’s address bar may just make the difference in being safe and being ripped off. If you’re not entering any personal info (meaning anything other than a name and an email address), you need not be concerned about the lock icon (secure server). But if you’re entering a credit card number, social security number, your home address, a cell phone number, etc. then it’s important that you look at the address bar to make sure you’re on a secure server. There’s a lot more going on in the address bar too… here are some tips to help you. If you use any popular browser it has an address bar. The address bar is where you type in the address (URL) of a site you want to visit. It’s also the place where you can see the address of the site your on. So, if you get to a site by clicking a link rather than typing it in, you’ll see the site’s address (URL) in the browser’s address bar. For instance, if you click http://www.thundercloud.net/infoave/new/ , your default browser will open and you’ll see http://www.thundercloud.net/infoave/new/ in your browser’s address bar. But what if I wanted to trick you? I could say, come on people now, smile on your brother, everybody come visit Cloudeight InfoAve News! Just click here. I could even show you the URL http://www.thundercloud.net/infoave/new/ and trick you. But we are honest hard-working souls with malice towards none… I tells ya…. so we would never send you someplace harmful. Maybe annoying, but never harmful! Too bad there are so many crooks and too many greedy people with to much time on their hands who spend all their time trying to make easy money. So, think of your address bar as your first line of defense against these flagitious, reprehensible, nefarious reprobates out to trick you into giving up your good name, good credit and your money. Here, we’ll show you what we mean. Let’s say you do your banking at Bank of America. You type in www.bankofamerica.com in your address bar and press Enter and voila the internet whisks you off to the banking site where you can log in and do your business. 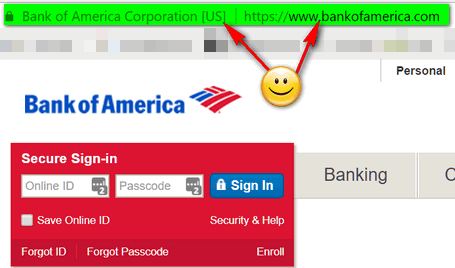 Notice that it says “Bank of America [US] ” in the address bar. And you can see it’s a secure site by the lock on the left edge and the https:// before the address. Just looking at your browser’s address bar to make sure you’re on the site you’re supposed to be on, an save you all kinds of worry, grief, and even money. All’s well, eh? For now. 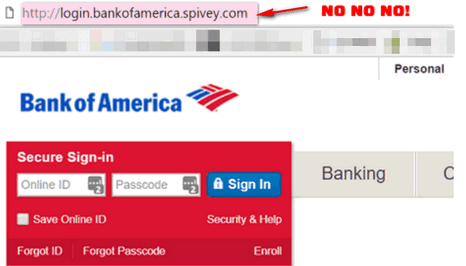 But let’s say some evil, malicious knave sends you an email that looks exactly like it came from Bank of America. And the email tells you that you need to log into your account and verify your username and password because, he says, there’s been suspicious activity on your account. He does this to trick you. And to make the trick work, he puts a link to your bank site with something like please login here. And not thinking, you click it. So, you click the link and you see this. Now, if you’re not paying attention, or you are tired or distracted, at a glance everything looks right. It looks like the Bank of America site and the login looks perfect. So, you type in your username and password – and nothing happens. Well, nothing happens that you can see. Somewhere, some lazy miscreant has tricked you into giving him (or her) your Bank of America username and password. And you can guess what he (or she) can do with that. But if you look closely at the page above, and look at your browser’s address bar, you see that the word before the dot com is not bankofamerica but spivey. Who the heck is spivey? Spivey was bully at my grade school. We called him poison. He’s not a guard at the landfill.Seriously, first the site (a banking site) is not showing the secure lock. You don’t see any identification in the address bar that this is Bank of America. None. And remember this: Only the name that appears right before the dot (.) is the domain name. So, for example, if you see http://support.microsoft.com/ the name before the dot com is Microsoft so it’s a genuine Microsoft site (as long as it’s spelled correctly). But if you see microsoft.support.spivey.com that’s not Microsoft. And it doesn’t matter if it’s a dot com, a dot org, a dot net, a dot.tv or any of the other designations, the name right before the .com, .net, .org, .tv, .info, etc. tells you the domain . If you see dell-support.hooligan.com it’s not a Dell domain and you should scurry away like a possum from a skunk. Or if you see support.mircosoft.com, it’s not Microsoft site – note the misspelling. So, the address bar is more than just a place to type in the address of a web site you want to visit. It’s a way to check that he site you’re on is legitimate; that it’s the site you want to be on – and the site you’re supposed to be on. Now you know more about the address bar and how it can help keep you safe. it says not secure. How do I make it secure? Though we collect no information, we’re going to switch to secure server status by this fall – even though we do not intend, even then, ask for any personal information. It’s an incredibly difficult process to convert a site with over 50,000 pages and gigabytes of data to a secure site. Honestly, if all you’re going to do is read articles or download a program, a secure status provides you with no advantages. In fact, there are many sites running on secure servers which distribute malware and worse. Many of these tech support scams are, in fact, running on secure servers. So a secure server status does not mean a site is safe, and a not secure status does not mean a site is not safe. You can’t make a site that shows “not secure” “secure”. But the term not secure implies some sort of risk and that’s not true unless your exchanging personal information with a site. It’s poor choice of words and it’s not correctly descriptive. Well said! Thanks for all you do to help us.